Before you get started picking out you curtain size please take a minute to read our Curtain Ordering Help Page. It will explain how to order the correct size allowing for the hook, curtain fullness and hanging height. We have many pre-defined curtain sizes on the website but they are NOT pre-made, these are just the most common sizes to facilitate easy ordering. Curtains are custom made to order, Curtains are not returnable or exchangeable so please ask any questions that you need to ensure you get the right size. We can order custom sizes in any of the colors or patterns if you don't see what you need. The color on your monitor can be adjusted so it may not be adjusted perfectly. The color sample images we provide are correct but may be a few shades off what you see on your monitor depending on how your monitor colors are adjusted. If the color needs to be exact please call us at 1-800-804-8549 and we will send you a fabric sample of the colors. Each section below covers one pattern of curtain, click on the section with the pattern you need, then you will see all the different heights & widths available in that pattern. We are here to help M-F 8am-5pm cst, if you have any doubts please call us at 1-800-804-9549 before ordering because we can't accept returns on curtains for any reason. Please read the Curtain Ordering Help Page before placing your order, it explains what you need to know to get the right size. 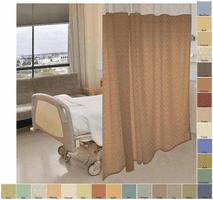 Designer Hospital Cubicle Curtain Fabrics - Special Order Only!